The Erin Crowley Foundation was created in 2007 in memory of our lovely Erin, who bravely battled childhood cancer. The foundation supports numerous organizations in Austin, Texas including the Dell Children's Medical Center, the Ronald McDonald House, and a scholarship fund at St. Michael's Catholic Academy. We hope you will take time to learn about Erin, her life, and the lives she touched and continues to touch through this organization. Thanks for visiting! May 5, 2016 - Mahsa Helforoush, a senior at Round Rock High School is the 2016 recipient of the Erin Crowley Scholarship. 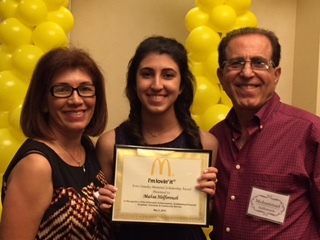 RMHC and McDonalds owners of Central Texas award Erin Crowley Scholarship on May 14, 2013 to Rini Sinha. You can now DONATE ONLINE to the Erin Crowley Foundation! ​Rini Sinha is awarded the 2013 Erin Crowley Scholarship. Debbie and Kevin attended the RMHC and McDonalds owners' award dinner the night of May 14, 2013 and happily posed with this year's recipient. Twenty-five other $1000 scholarships were given to area Seniors. Rini received $4000 from the Erin Crowley Scholarship. Debbie shared the following words with all the RMHC scholars and their families that night at the dinner. "Thank you to McDonald's restaurant owner - operators and RMHC for the honor bestowed in Erin’s memory. Thank you for this opportunity to speak and to help present the scholarship that bears her name. My son Kevin joins me tonight for this special annual occasion for our family. Congratulations again to all of you and especially to the winner of the 2013 Erin Crowley Scholarship, Rini Sinha."